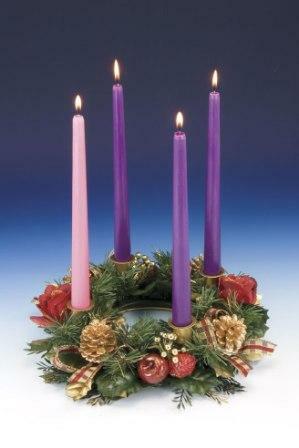 It’s Advent time again; the beginning of the “church year.” We change the paraments to purple (or blue, in some cases), hang the greens, set up the advent wreath with candles, and we engage in the ceremonies of the season leading to the birth of Christ. How do we keep the “been there, done that” jaded cynicism out of the experience? Is it possible to infuse the season of Advent with a true spirit of anticipation and waiting, looking forward with hope to the event that will forever change the course of history? Can we make the biggest deal of all time a big deal one more time? Do we really want Jesus the Christ to be born in our world once more? Do we want to have our values and life practices turned on their heads? We don’t seem to take much of the gospels seriously to begin with — do we really think God has changed and that it would be easier today than 2000 years ago? Christmas is indeed a blessing, but it also is a responsibility. To receive the Christ is to agree to fundamental and wide-sweeping change — both personal and communal. We will not only think differently, but act differently. We will give more and complain less. We will sacrifice personal comfort for caring and compassion. We will leave home and family safety to venture out to serve strangers in the world. We will remember the true meaning of Christmas, and it will change us. What are we truly anticipating? Who do we really hope will come? A savior to make us new people, or a cute little baby we can adore and ignore? I don’t agree with every criticism I hear from younger Christians, but I think they’re onto something here. We have watered down Christmas in the church. We gripe that it has been co-opted by pop culture, but we have also done it to ourselves. We need to wake up and realize that Christmas is much more than warm feelings and happy events. Christmas is the real “call to action” of all men and women who want to become disciples through whom God transforms the world. Thanks for this fantastic post. I’ve had similar experiences at my home church. Christmas has become so familiar and sentimental (which are not inherently bad) that we’ve lost the Yoder-esque revolution of the event. Part of this is due to a market that prefers warm-fuzzy feelings to the anti-materialist message of Christ, but the church has done little to stop it.